August 22nd was the best day of my life. Period. There is nothing like the feeling of hearing your babies for the first time. Elena was born at 7:53 am at 6.8 lbs. Yael was born one minute later at 7.3 lbs. 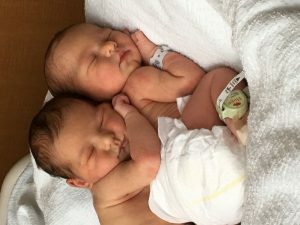 They were the big twins all the nurses were talking about. Having a baby via c section was a bit surreal. I don’t have anything to compare it to, but there’s tons of activity going on and as the mom I’m laying there with my arms stretched out and a curtain on my face waiting to meet my babies. I got a little skin to skin with each one before they were taken to the nursery and I was sent to recovery. Those first few days and even now, I look at them with awe. I can’t believe they are mine. I can’t believe I made them. It’s incredible to fall in love with someone so instantly. They are my greatest accomplishment. Sharon, me da mucha alegría leer tus palabras, con todo el cariño del mundo les deseo a las tres una vida maravillosa !!!!! Congratulations on the birth of your beautiful twins. I’ve been following your story for a while, I’m very happy for you. I’m delurking to say congratulations! I’ve been following your blog for a long time and have been thinking about you these past couple weeks! Your journey has helped me so much and I am so thrilled that your dream has now come true. They are so beautiful! Also delurking to congratulate you. Your story has helped me so much. Wishing your two adorable miracles beautiful, fulfilling lives. MAZAL TOV! All the best for you and the beautiful daughters! They’re perfect! We are all so happy for you and your girls. Sharon, empiezas una nueva etapa en tu vida, que belleza de foto,y que lindo que escribes todavia…. Mazel tov y naches y Lindos caminos juntas. Muy contenta por ti ….